This is an extract from Robert Borrowmans Beckenham book published in 1900. Borrowman was a curator of The Parish Church of St Georges, Beckenham. In 1740 Margaret Finch, a person of notoriety in the locality, who was known as Queen Of The Gypsies, died. She is reported to have been 109 years old, and was buried in a deep square box (near the foundations of the present tower) instead of an ordinary coffin. From a habit of sitting on the ground with her chin on her knees, generally with a pipe in her mouth and attended by her faithful dog, her sinews became so contracted that she could not rise from her posture. She resided for a long time at Norwood, and a sermon was preached on the occasion of her funeral, which was attended by a large concourse of people and even two mourning coaches. A picture of Margaret Finch used, to hang outside a public house in Norwood, whose woods were, until recent times, a favourite resort of travelling gypsies. At the beginning of the last century the grand-daughter of Margaret Finch lived at Norwood and inherited her title of Queen. She was the niece of Queen Bridget, who was buried at Dulwich in 1768. It is stated that we failed to find any authority for the statement, that a celebrated King Of The Gypsies was also buried at Beckenham, and that his body, after lying in state on Penge common, was followed to the grave by a number of his tribe clad in velvet coats, the buttons of which were made of half-crowns, those on there waistcoats being made of sixpenny pieces. During the work of building the present church tower, a careful watch was made for square box enclosing the remains of Margaret Finch, but no trace was found. 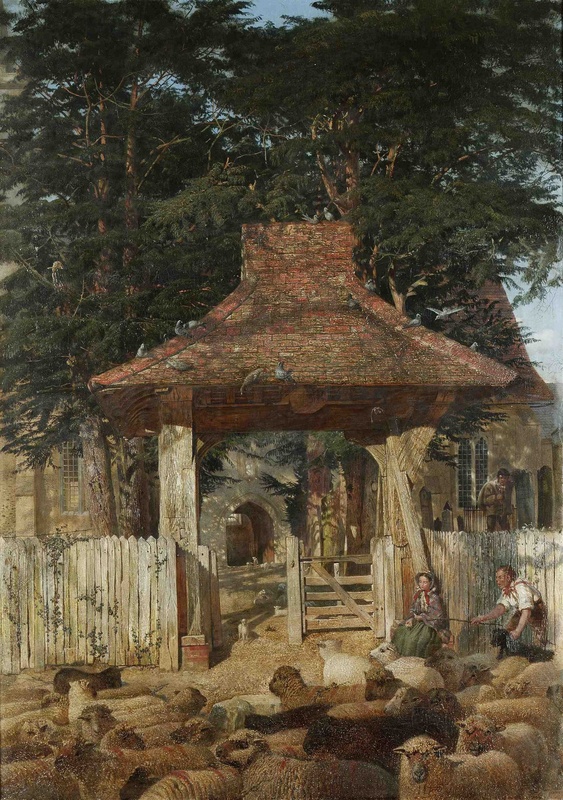 Editors note, the painting is by a Victorian artist called John Mcullum depicting the Lynch gate through the ages. It is believed that the lady sitting down is Margaret Finch. To this day crystals, mainly amethysts are left close too the Lynch gate. They are nowhere else in the graveyard. I think Borrowman was either church wadrden or curate, not curator. His book is worth a read or even reproduction, only available in reference libraries unfortunately.